Given the size and scope of the Frank Lloyd Wright Foundation Archive, the archive has been divided into distinct collections by format type. Below are overviews and links to finding aids for each collection. 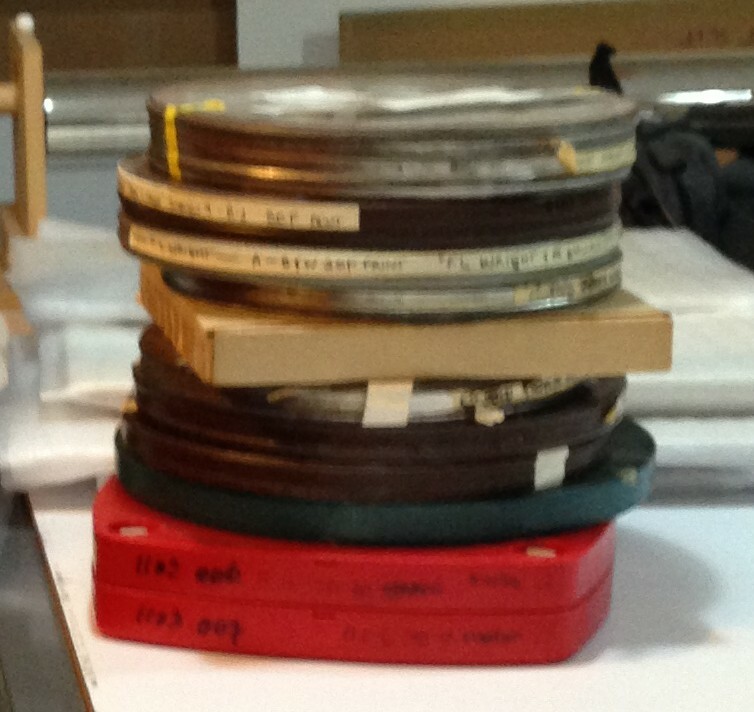 Also listed here are additional Wright materials held in other Avery Drawing & Archives Collections. Collections identified as being in process are closed to researchers while we continue our work of organizing and preparing the materials for access. We recommend that researchers acquaint themselves with the Frank Lloyd Wright Project List to identify project numbers relevant to their research. These project numbers appear in different collections within the archive, such as the Architectural Drawings, Photographs, and Specifications. Nearly 1,100 projects, built and unbuilt, are represented in this remarkably comprehensive collection. 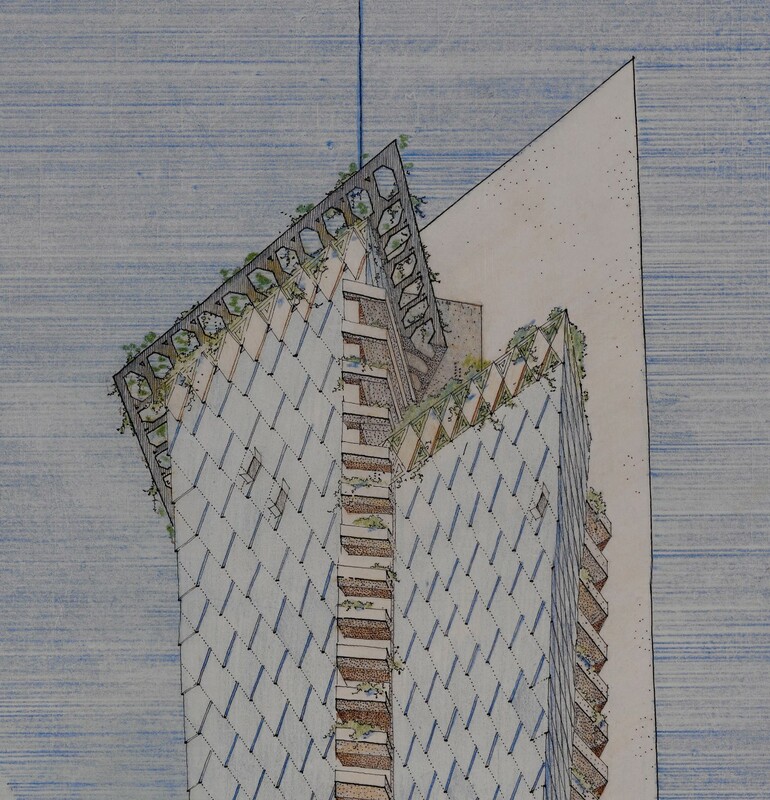 The over 24,000 sheets in the collection include plans or drawings developed in the conception, presentation, and execution of buildings. The collection includes Wright’s own writings, together with Wright’s copies of studies of his life and work in which he collaborated or participated. The books and publications range from occasional articles, brochures or guides to major buildings, to book length monographs. A number of copies are annotated by Wright either for proposed revised editions or as commentary. Over 140,000 documents in this collection of correspondence serve as a core resource for understanding Wright’s personal and professional activities, relationships, and ideas. The correspondence also includes project records such as specifications, contracts, supply orders, invoices and receipts. 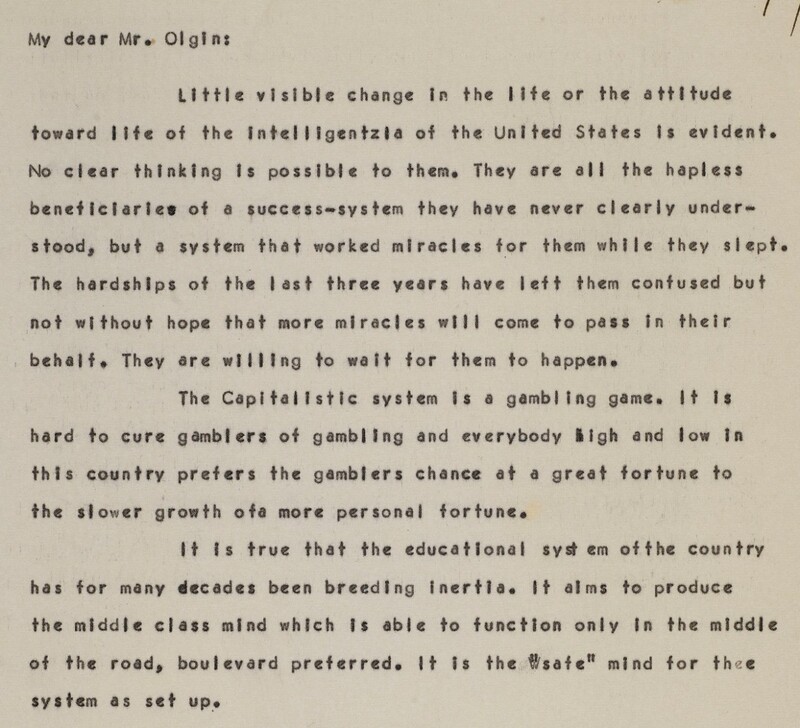 The bulk of the correspondence is from the 1930s until Wright’s death in 1959. Frank Lloyd Wright: an index to the Taliesin correspondence, edited and with an introduction by Anthony Alofsin, is a master index to the Wright correspondence held in the archive. The five-volume printed index was published by Garland Publishing (1988) and prepared under the sponsorship of the Archives of the History of Art, the Getty Center for the History of Art and the Humanities. Copies of the published print index are available for consultation at Avery, the Getty Research Institute and other library collections. Please direct all inquiries about the Correspondence to avery-drawings@library.columbia.edu. 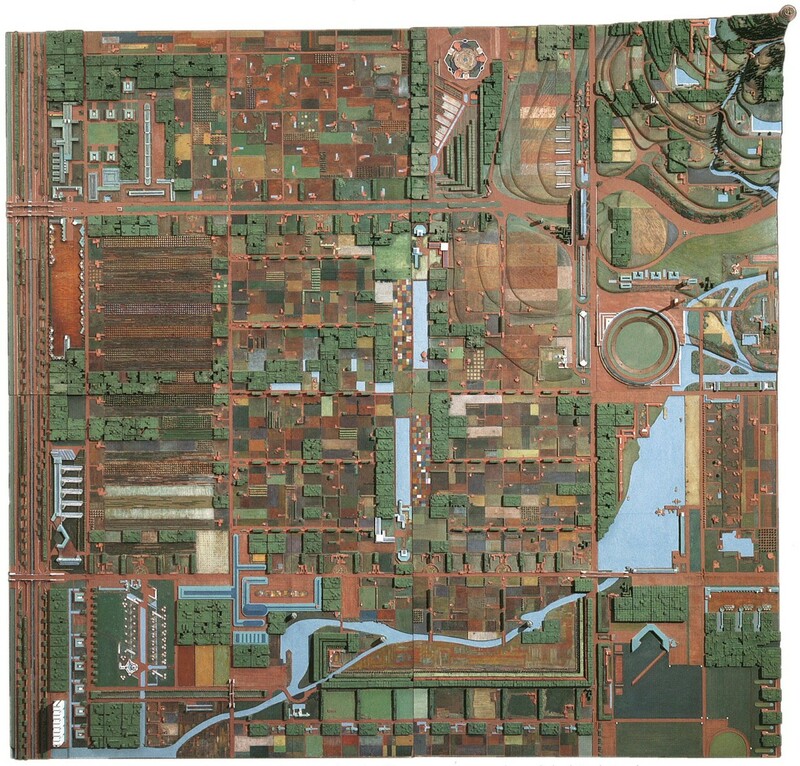 Wright’s work and ideas were exhibited throughout the United States and Europe on numerous occasions during his lifetime. 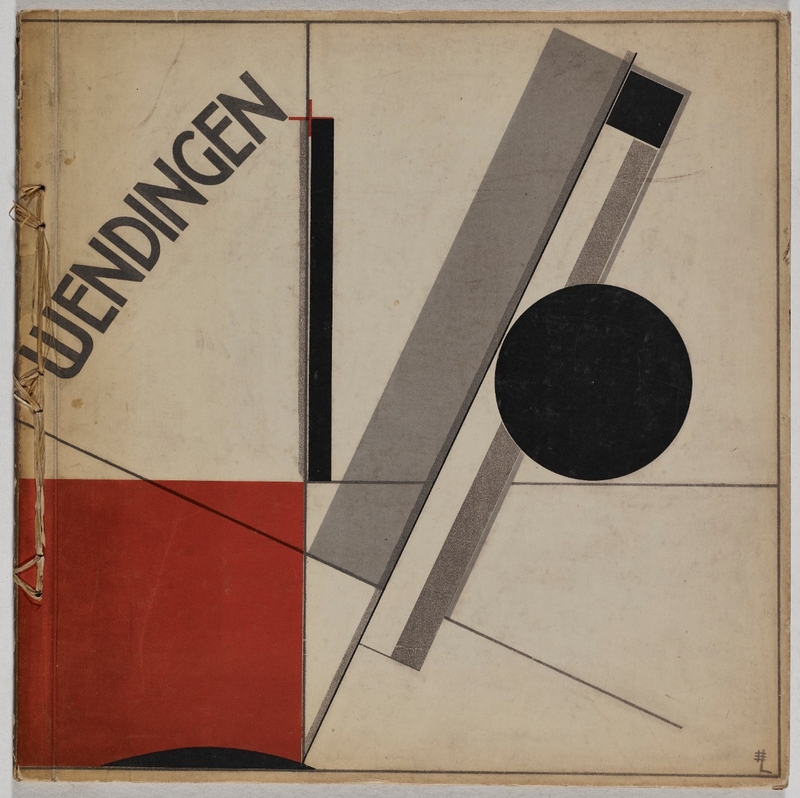 This collection represents over 40 of those exhibitions, and includes shows curated by Wright as well as those mounted by some of the most significant curators and institutions of the time. Included in this series are brochures, announcements, posters, publicity, clippings, and images of photomurals. 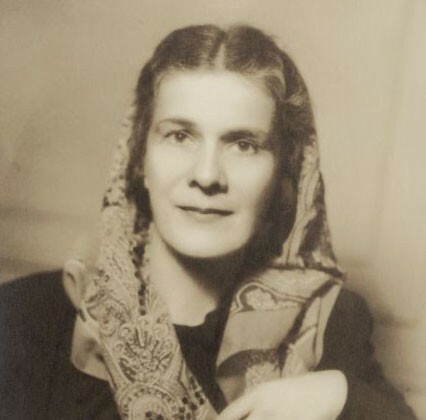 “Talk to the Taliesin Fellowship” was a regular lecture series at Taliesin where Wright addressed the fellows and apprentices on a range of philosophical and personal topics. The collection includes transcripts of 236 of those talks dating from 1948 until a few weeks prior to Wright’s death in 1959. The manuscripts collection includes writings, lectures, and talks dating from 1894 until his death in 1959. The manuscripts range from handwritten drafts to heavily corrected typescripts and galley proofs. Included in this comprehensive collection of writings are a large number of unpublished pieces which expand upon Wright’s published ideas on architecture, art and aesthetics, and present further insights into the architect’s views on politics, religion and morality. The collection includes specification documents for approximately 170 projects. Specification documents in this series range from descriptions and instructions regarding the quality of work and materials, to guidelines for plumbing, electricity, wood, metal, and painting work. For many earlier projects and for more modest projects throughout his career, Wright incorporated specifications directly onto design drawings; these are not included in this series but rather are listed in the Architectural Drawings series. 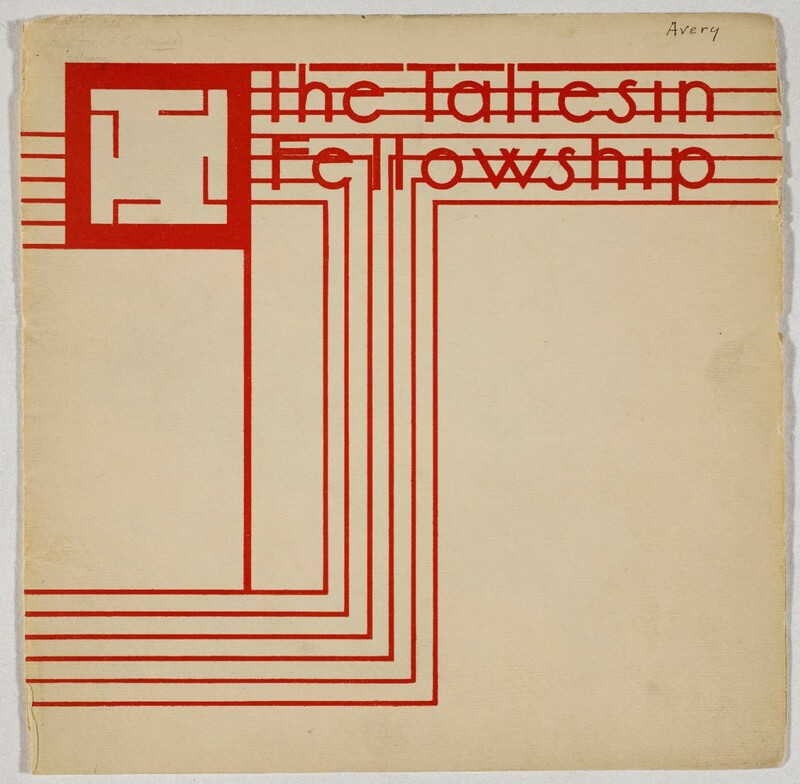 The collection includes the project files and architectural drawings of the Taliesin Associated Architects, the firm that was established after the death of Frank Lloyd Wright in 1959. Projects include commissions that were left on Wright’s desk at the time of his death as well as independent commissions and renovation work. 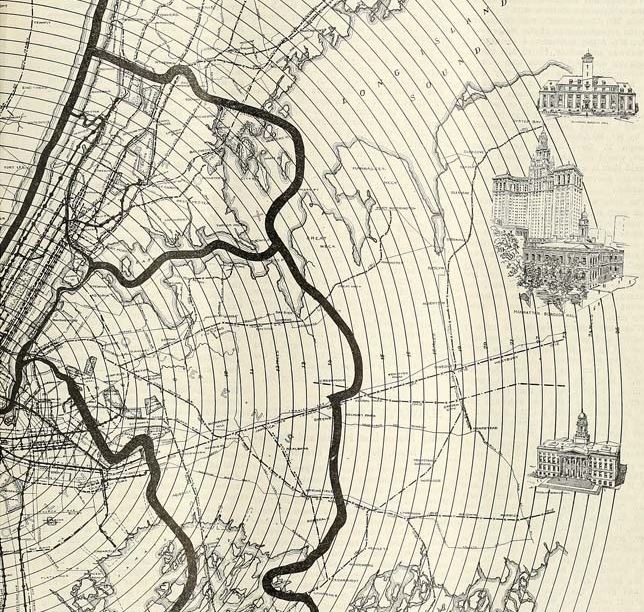 Around 400 projects are represented, either in the paper records, the architectural drawings, or both. 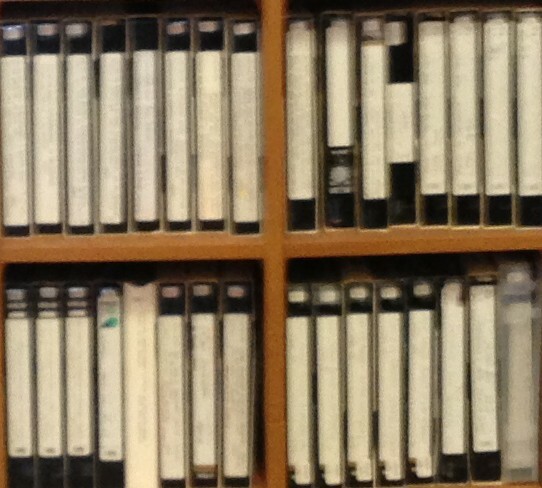 This collection includes over 300 film reels. Footage includes home movies of Wright and family, life and events of the Taliesin Fellowship, and informal site and building visits. The collection also includes professionally produced recordings of interviews and talks by Wright and promotional coverage of built works. Models and architectural fragments are held at the Museum of Modern Art. 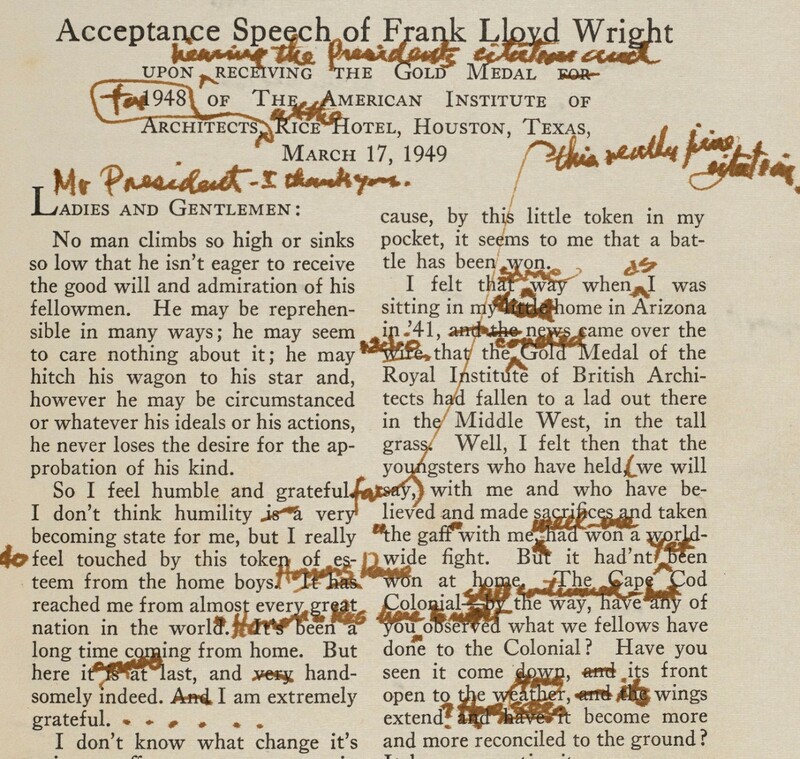 The bulk of the Olgivanna Lloyd Wright papers consist of extensive correspondence, autobiographical writings and other manuscripts, musical scores and recordings, and transcripts of talks by Olgivanna to the Fellowship. 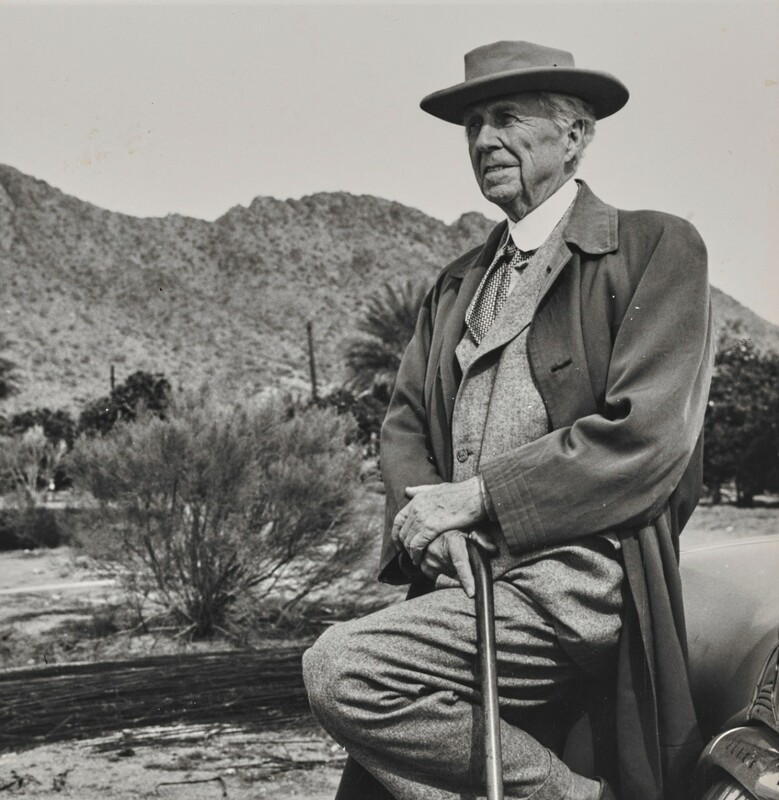 The Oral Histories collection consists of audio recordings and transcripts of interviews conducted by Foundation members, which document the life and activities of Frank Lloyd Wright and the Taliesin Fellowship. Interviewees include apprentices, clients, family, friends and acquaintances, scholars, associates, and other architects. The FLWF Archive includes various other collections collected by the Foundation including the papers and drawings of Eugene Masselink, Wesley W. Peters, Kay Rattenbury, George Gurdjieff, Irma Strauss, Mary Lescohier and William Marlin. Additionally, the archive contains memorabilia such as awards, certificates, and medals, as well as scrapbooks and newspaper clippings, collected papers and other personal artifacts related to Frank Lloyd Wright and his family. 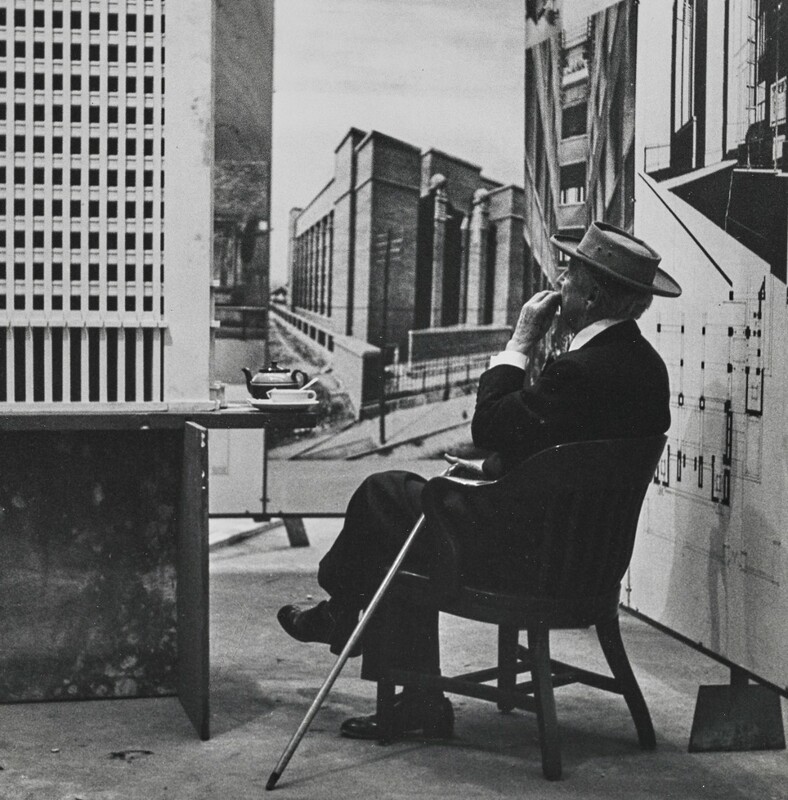 With more than 30,000 identified images (and hundreds more unidentified), the photograph collection spans the whole of the 20th century and is a rich visual documentation of Wright’s professional practice, personal life, and architectural legacy. The photography collection includes prints, negatives, contact sheets, transparencies, slides, photocopies, and many photographic duplicates. It is arranged in five series: Project Photographs, Personal and Family Photographs, Taliesin Fellowship Photographs, the Taliesin Slide Library, and Lantern Slides. This collection documents the output of the independent printing press established at Taliesin in the 1930s. The collection consists of brochures, pamphlets, newsletters, Taliesin magazines, festival programs, invitations, and miscellaneous ephemera such as Christmas cards and stationery. 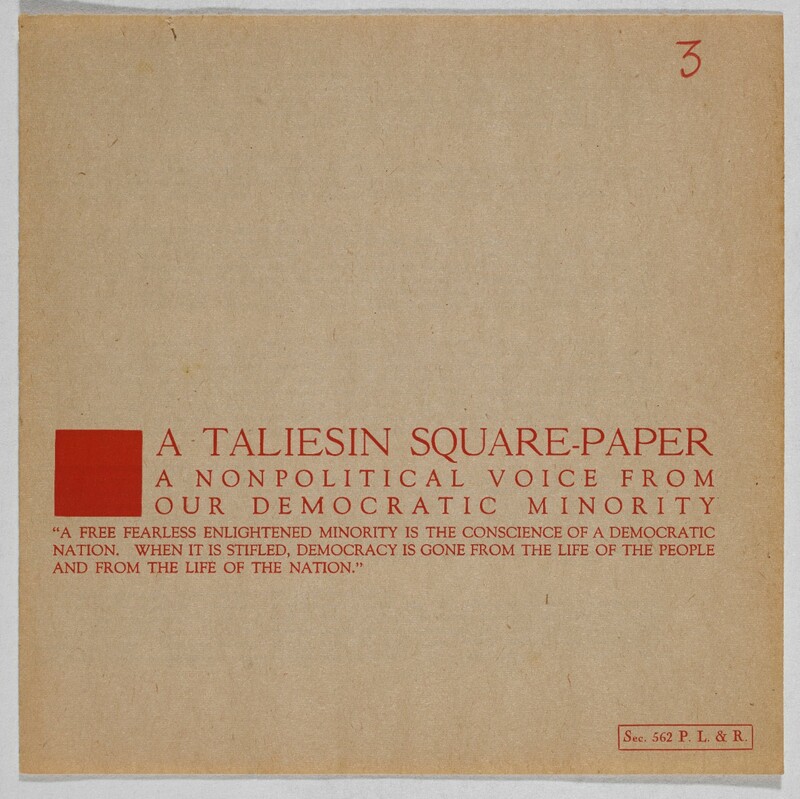 The collection also includes every issue of the Taliesin Square Papers (also referred to as T-Square Papers) dating from 1941 to 1953. 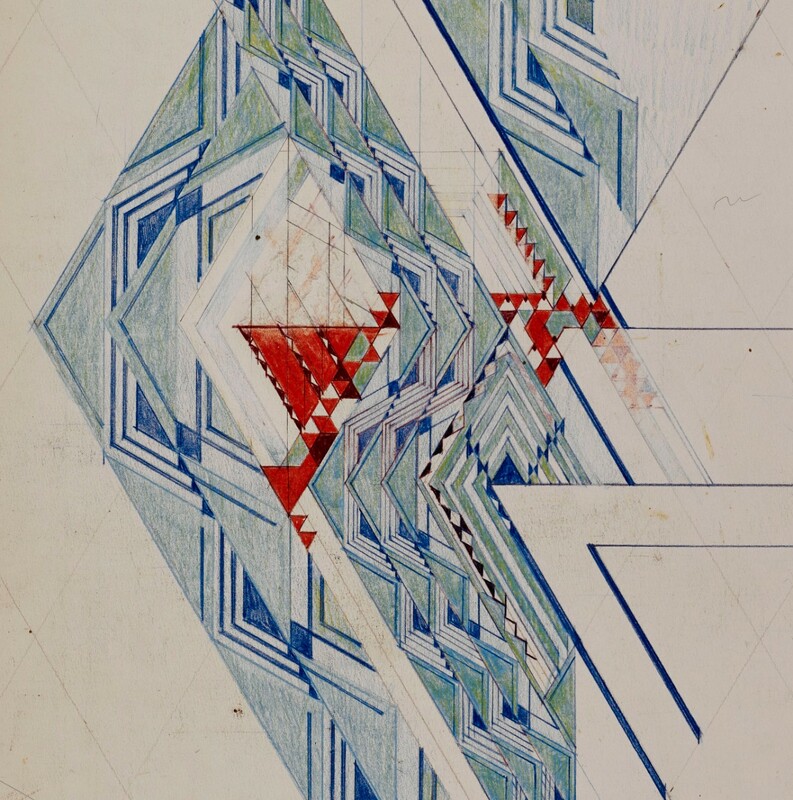 Avery Library’s Department of Drawings & Archives has the world's largest collection of archival holdings on Frank Lloyd Wright. 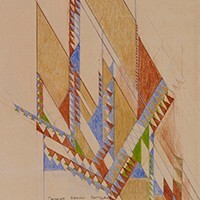 In addition to the Frank Lloyd Wright Foundation Archive, which was acquired in 2012, Drawings & Archives has historically collected archives documenting the life and work of Frank Lloyd Wright and other related figures such Louis Sullivan, Edgar Kaufmann, and Edgar Tafel, among others.